If It's Hip, It's Here (Archives): 10 Advertising Campaigns That Used Faces Made Of Art, Images Or Items. 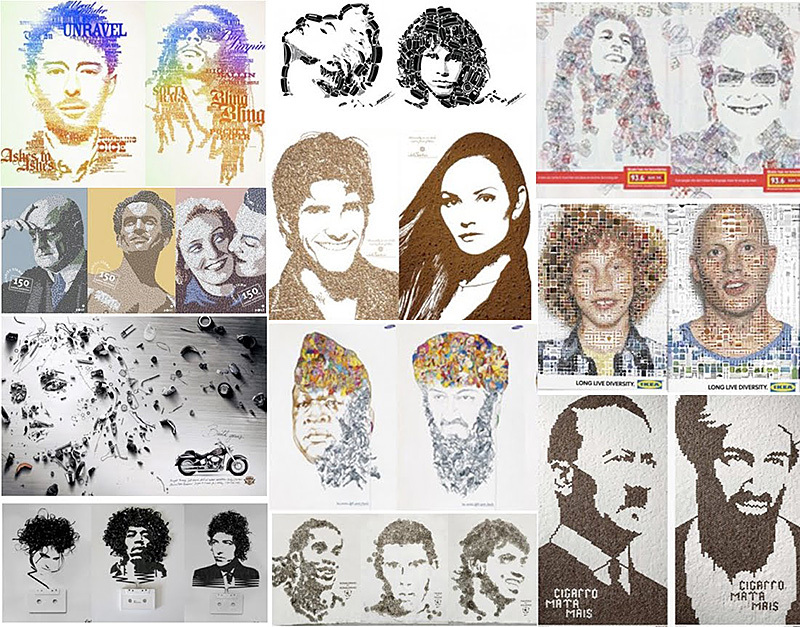 10 Advertising Campaigns That Used Faces Made Of Art, Images Or Items. It's not uncommon to see trends in the creative executions of advertising, but here's one that reached critical mass. The compositing of items to create human faces has been used in several different ad campaigns from reputable agencies all over the world. I saw a post on Brainpickings.org via PicoCool about three campaigns that are visual tributes to music using this technique. It was then that I realized, I knew of several others, so I decided to do a round up of ten campaigns for you, not exclusively related to music. Here are ten (now, just updated..so make that 11!) different ad campaigns (and one art project) all created within the past 3 years. Each of them is well-executed and very nicely art directed... but I think it's time to put a moratorium on assembled faces. 1. The first is an art project by multimedia artist Iri5 who considers this her "Ghost In The Machine" series in which Robert Smith from The Cure, Jimmie Hendrix and Bob Dylan are all composed of cassette tape. Most impressive is that these are NOT photoshopped or painted but use a real cassette and tape. 2. The stunningly composed Grammy Ads (and accompanying tv spot) incorporate a concept by using the musicians favorite songs typographically to compose the image. 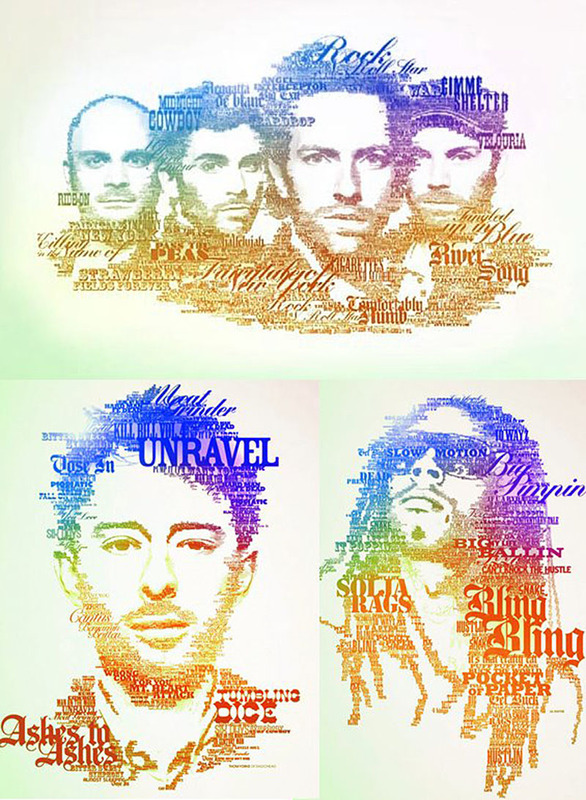 Shown below are Coldplay, Thom Yorke and Lil' Wayne. 3. 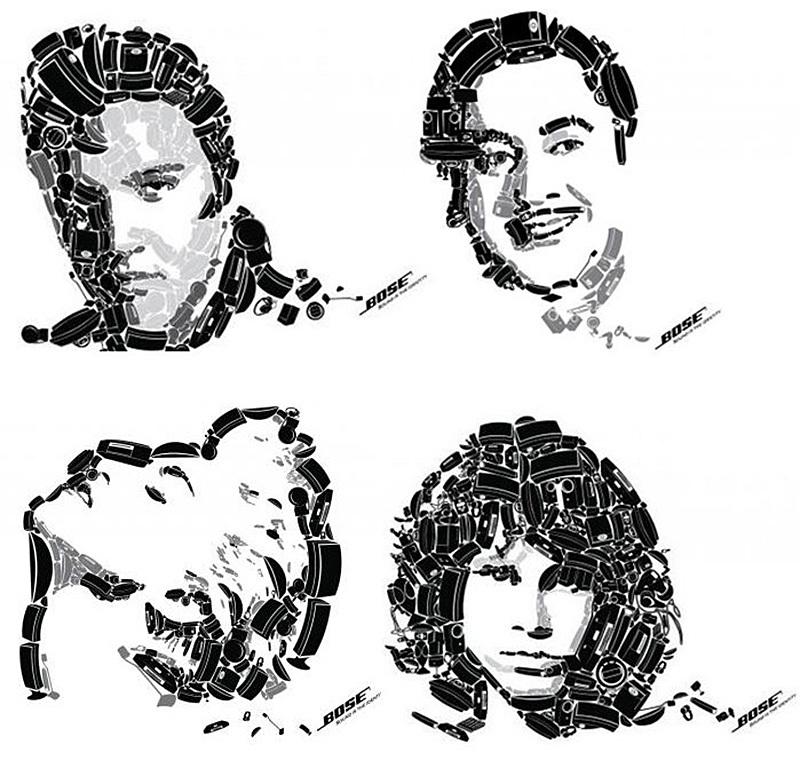 These four Bose ads feature Elvis, Kishore Kumar (an Indian singer who resembles Wayne Newton), Madonna and Jim Morrison made up of black and grey silhouetted audio components. 4. The ads for RAM FM, a Jerusalem and Ramallah radio station known as Peace Radio, communicate the fact that the station brings people of different beliefs together via the use of passport stamps to comprise the visuals. 5. One of my personal favorite executions are these stunning out of home posters and bus shelters, which make the faces of actual postage stamps, celebrating Finnish Stamps for the 150 year Jubilee Exhibition. 6. An Argentina agency created these Nike Football ads out of little stamped footballs (or soccerballs for those of us in the States) as tributes to individual players. 7. 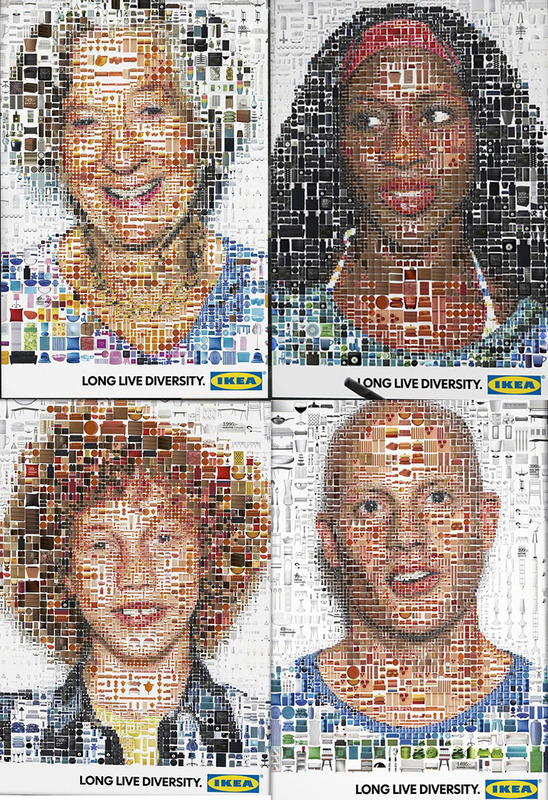 These bus shelters for the Swedish furniture chain, IKEA, celebrate diversity by showing people of different ages and races all made up of the various product items available at IKEA. 8. 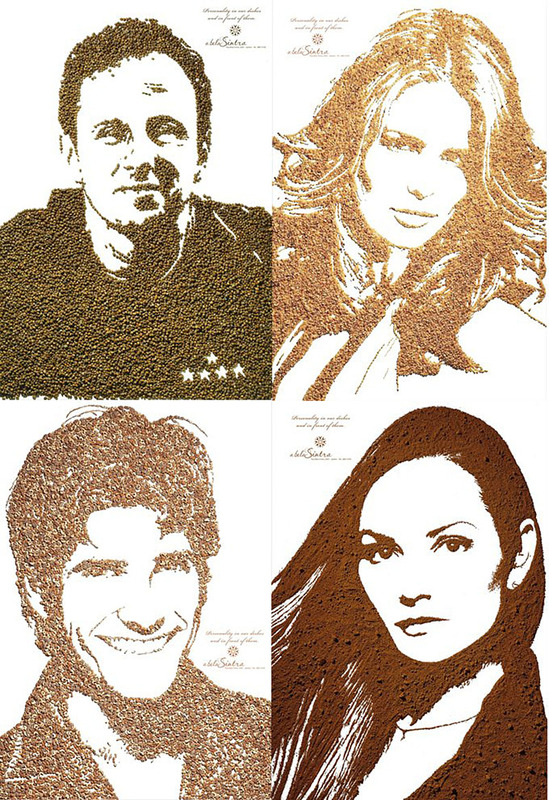 A nice attribute of this campaign for A Bela Sintra, a restaurant in Sao Paulo, is the varied state of the beans for the art, from full beans to finely ground, all make up the faces. 9. Playing off the adage that "Music soothes the savage beast", this campaign for the Samsung i450 uses terrorists and dictators like Idi Amin and Osama Bin Laden to show how music in their heads can bring an end to fighting. 10. 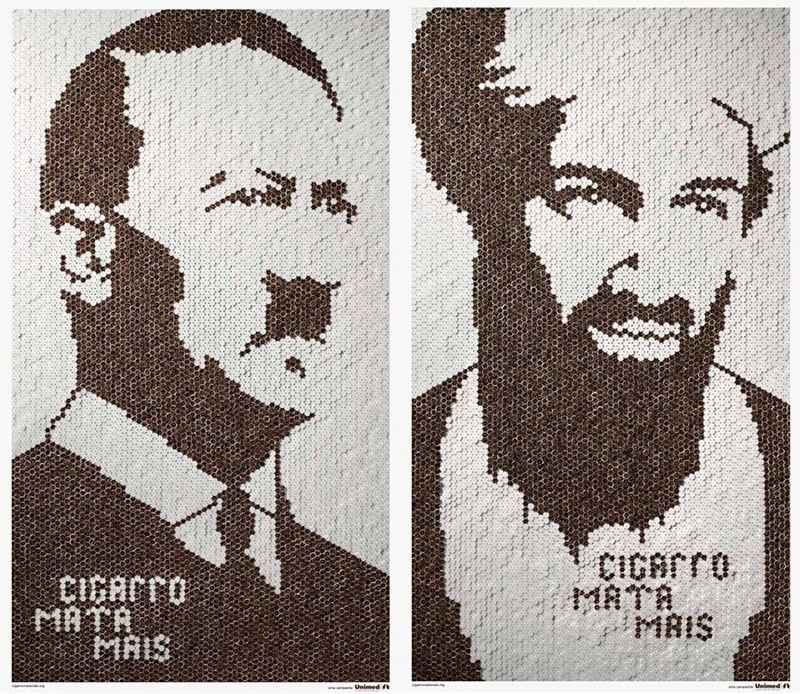 And finally, an anti-smoking campaign from Unimed uses actual cigarettes to comprise the faces of such hateful characters as Hitler and Osama Bin Laden with the phrase "cigarettes kill more" is accompanied by an animated tv spot of 'war' signed off with "smoking kills more". 11. 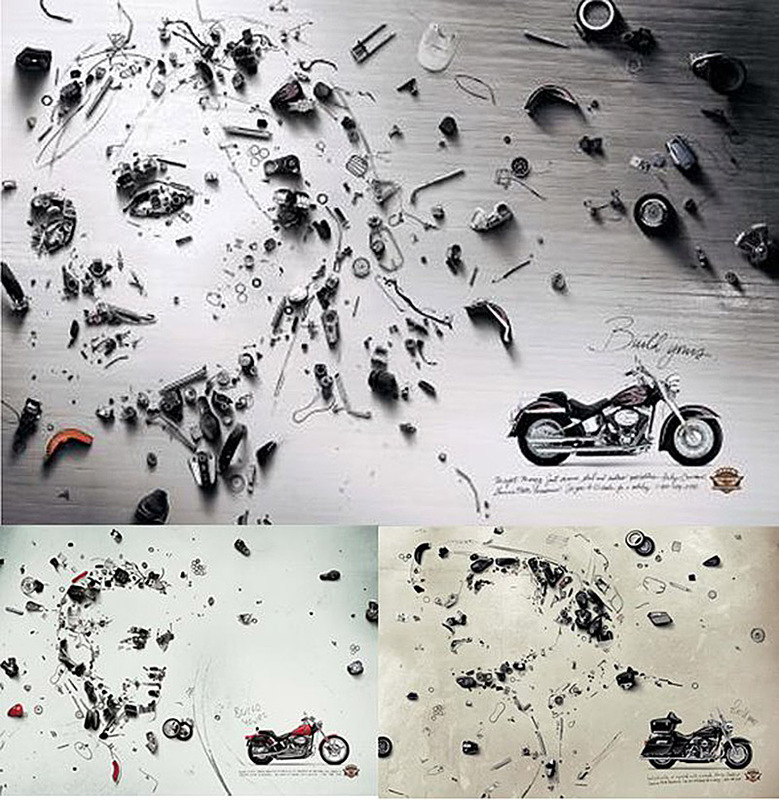 Another nicely constructed campaign, this one for Harley Davidson that uses tools and motorcycle parts to make up the visages. A big shout out to Ivan and his Ads Of The World where I was able to find many of the visuals and credits.